Landscape architecture is the discipline that designs areas to be landscaped prior to the onsite work, monitors the quality of the onsite work, and ensures that the finished product matches the initial design. 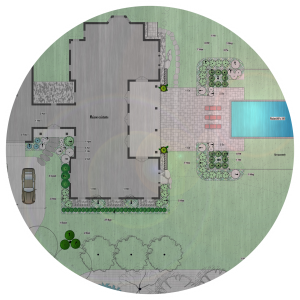 The landscape design plan is the tool of choice to properly plan your outdoor living spaces. It will enable you to visualize the different sections and the links that connect them, to plan the different phases of a complex project, or simply to grasp the subtleties, and the proposed configurations and blending. During the initial phase of the design process, one of our experts will meet with you to clearly identify your needs, personal tastes, and budget. We then obtain all the required information before going back to the drawing board: measurements, ground levels, photos, and much more. After drawing a preliminary sketch, a second meeting (or more as needed) enables us to put the finishing touches on the design work to create a landscape that will exceed your expectations. The tool of choice to properly plan your outdoor living spaces.